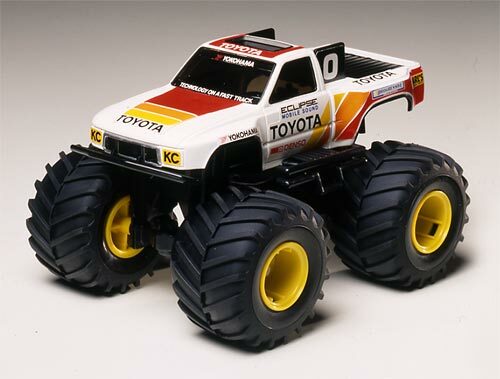 【 Palm-Sized Racing Truck 】 This plastic assembly kit features 4WD and large-diameter tires to enable exciting wheelie and two-wheel driving action. The motor is mounted at the center of the chassis and provides power to the front and rear wheels via a sidewinder gear setup. The body features flared fenders and is matched with 52mm diameter, 31mm wide tires for plenty of laughs while the racing livery is recreated with stickers. In addition, the model's easy assembly does not require any cement.